जनरल केटेगरीना आर्थिक रीते पछात वर्ग (EBC) ने 10% अनामत आपवानो ऐतिहासिक निर्णय गुजरात सरकारे कर्यो छे. हाल अनुसुचित जातिने 7 टका, अनुसूचित जनजातिने 15 टका तथा ओबीसी ने 27 टका अनामत आपवामां आवे छे ते यथावत ज रहेशे. आ उपरांत रु. 6 लाख सुधीनी वार्षिक आवक मर्यादा धरावता बिन अनामत वर्गना लोकोने हवेथी अनामतनो लाभ मलशे. 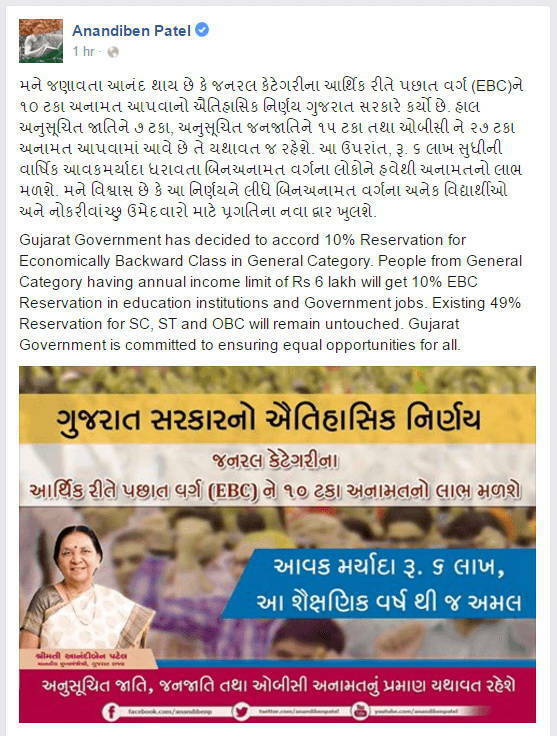 Official Social Media Message : Gujarat Government has decided to accord 10% Reservation for Economically Backward Class in General Category. People from General Category having annual income limit of Rs 6 lakh will get 10% EBC Reservation in education institutions and Government jobs. Existing 49% Reservation for SC, ST and OBC will remain untouched. Gujarat Government is committed to ensuring equal opportunities for all. Official Social Media Message जोवा माटे अही क्लीक करो.